Education Minister Bennett slams Defense Minister Liberman's willingness to cave to Hamas, says it will lead to conflict on Hamas' terms. 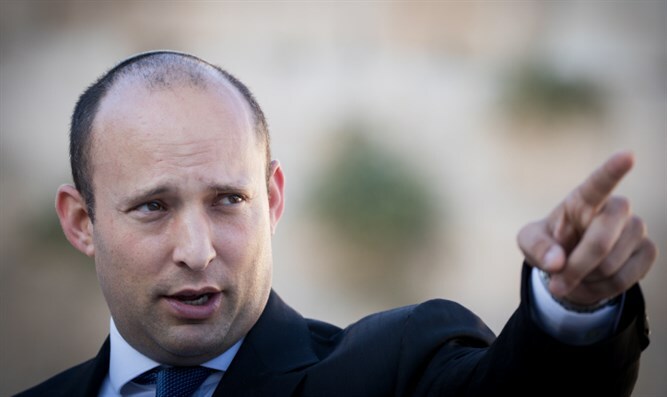 Education Minister Naftali Bennett (Jewish Home) slammed Defense Minister Avigdor Liberman (Yisrael Beytenu) for the proposed agreement with Hamas. The proposed deal between Israel and Hamas is brokered by Egypt and expected to include improvement in the humanitarian conditions in Gaza, as well as the construction of a seaport in the Egyptian city of Ismailia and an airport in Sinai. Speaking to Yediot Aharonot, Bennett said, "Liberman chose to give in, and this will lead to war. His hesitation and his hallucinatory perception, according to which Gaza residents will bring down Hamas and bring security to residents of the Gaza border area, are completely baseless and irresponsible." "The same Liberman who promised to bring down Hamas and eliminate [Hamas leader Ismail] Haniyeh is now giving them rewards, at the expense of the State of Israel's security. His weak policy, covered with pragmatism and responsibility, allows Hamas to burn the south for 140 days and to dictate to residents when they have to run to their bomb shelters and when they can leave them. "Anyone who gives in to terror brings terror - and Liberman gave in. His approach endangers the State of Israel and will bring an unavoidable conflict on the terms Hamas dictates and at a time which is convenient for them." A spokesperson for Liberman's Yisrael Beytenu party responded: "The Israeli government's policy is decided by the Cabinet, or at least by those who are present at the relevant meetings. Anyone who is ready and willing to sacrifice our soldiers' blood on the altar of political concerns is not worthy of being involved in security issues. It would be better for him to spend his time preparing for the upcoming school year, which he is responsible for."